Raise awareness for high alert medications and eliminate the potential for medication errors! Spacious, highly visible Red storage bin requires two action steps for picking insulin from the refrigerator: 1.) Read the warning labels on the outside of bin and 2.) Lift the lid to retrieve insulin vial. Both steps require staff to stop and think about whether they are picking the correct product. Recent JCAHO inspections have focused on medication errors surrounding insulin storage and dispensing. 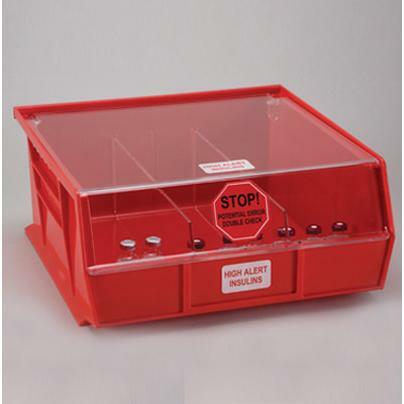 The Large High Alert Insulin Bin serves as a safe storage solution. Distinct appearance differentiates this bin and high-risk insulins from other insulins and supply bins which eliminates potential medication errors during storage and dispensing. “High Alert Insulin” and “Stop Potential Error Double Check” labels are highly noticeable for the person picking the insulin from the refrigerator. Additional labels are sold separately (#2079). Lid and labeling serve as a cue for the health care professional to read and verify before using. Includes two clear acrylic dividers which evenly divides the bin into three sections.